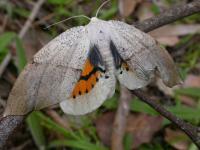 Asura lydia Photo E Collins Family Arctiidae. 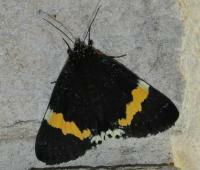 Includes Footmen and Tiger Moths.Has commom name Lydia Lichen Moth. 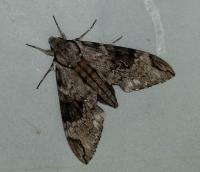 Nocturnal in habit and a weak flier. 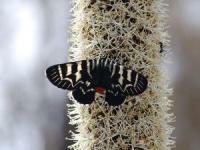 Photo E Collins Family Arctiidae. 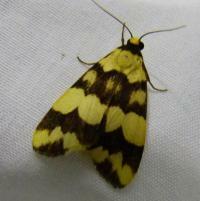 Includes Footmen and Tiger Moths.Has commom name Lydia Lichen Moth. Nocturnal in habit and a weak flier. 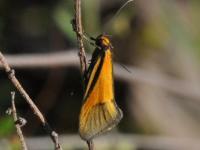 Comocrus behri Photo E Collins A native day flying moth seen here mating. The orange warning markings deter predators. The message is " not nice to eat". May be confused with the grapevine pest. 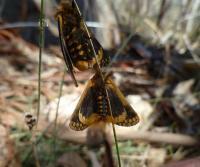 Photo E Collins A native day flying moth seen here mating. The orange warning markings deter predators. The message is " not nice to eat". May be confused with the grapevine pest. Cup Moth Cocoon Family Limacodidae Photo E Collins Cup moths create beautiful cocoons cleverly attached to a twig.Here the lid is hanging and the pupal shell is protruding from the cup. Some species pupate in the ground litter. 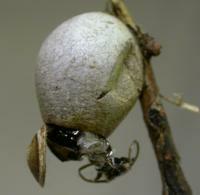 Photo E Collins Cup moths create beautiful cocoons cleverly attached to a twig.Here the lid is hanging and the pupal shell is protruding from the cup. Some species pupate in the ground litter. Doratifera quadriguttata Photo N Blair This colourful caterpillar is the larva of the Four-Spotted Cup Moth. When disturbed red stinging hairs protrude from the four balck spots on its front. Photo N Blair This colourful caterpillar is the larva of the Four-Spotted Cup Moth. When disturbed red stinging hairs protrude from the four balck spots on its front. 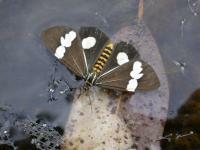 Epicoma tristis Photo G Johnson The Brown Ring Epicoma Moth. The caterpillar of this moth is the processionary caterpillar which, when in great numbers can defoliate Golden Wattle foliage. Seen here mating in February. 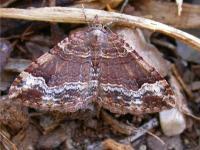 Photo G Johnson The Brown Ring Epicoma Moth. 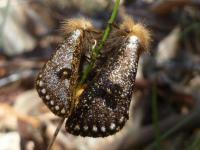 The caterpillar of this moth is the processionary caterpillar which, when in great numbers can defoliate Golden Wattle foliage. Seen here mating in February. Epicoma tristis Photo G Johnson Brown Ring Epicoma Moth 2 showing the orange-barred body and sending nature's message" I am not nice to eat"
Photo G Johnson Brown Ring Epicoma Moth 2 showing the orange-barred body and sending nature's message" I am not nice to eat"
Epyaxa sp Carpet Moth Photo E Collins Sp is probably E. centroneura. Photo E Collins Sp is probably E. centroneura. Gastrophora henricaria front view, female Photo E Collins Note the mottled pattern on the legs. The male is very different in shape. Photo E Collins Note the mottled pattern on the legs. The male is very different in shape. Hippotion celerio Larva and pupa Photo E Collins The caterpillar has the tell tale spine of Hawk moths. It curls up when disturbed.It pupates in the soil. 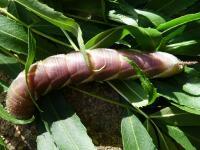 Photo E Collins The caterpillar has the tell tale spine of Hawk moths. It curls up when disturbed.It pupates in the soil. 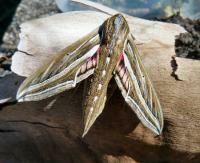 Hippotion celerio Vine Hawk Moth Photo E Collins Often seen at dusk hovering over its food plant taking nectar. Photo E Collins Often seen at dusk hovering over its food plant taking nectar. Idaea inversata Photo J Heywood November. Distinguished by the pale line on each forewing. Wingspan 2cms. Photo J Heywood November. Distinguished by the pale line on each forewing. Wingspan 2cms. Moth Caterpillar - Looper (Geometridae) Photo N Blair This looper caterpillar is feeding on a Maroonhood Orchid, Pterostylis pedunculata. Floral caviar! 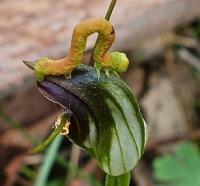 Photo N Blair This looper caterpillar is feeding on a Maroonhood Orchid, Pterostylis pedunculata. Floral caviar! 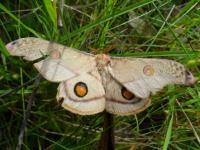 Oenosandra boisduvalii female. 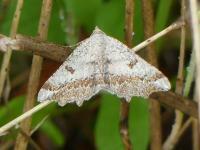 Boisduval's Autumn Moth Photo E Collins The male of this sp is greyish. This female is laying eggs on a Bull Oak. Photo E Collins The male of this sp is greyish. This female is laying eggs on a Bull Oak. 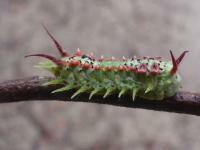 Opodiphthera eucalypti Emperor Gum Moth larva Photo J Heywood Food plant eucalypt. 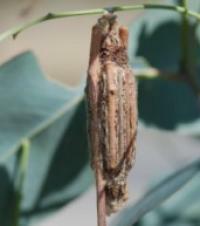 This larva is ready to pupate and the cocoon is shown next to it. 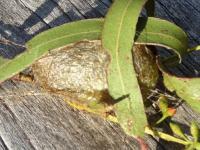 Photo J Heywood Food plant eucalypt. This larva is ready to pupate and the cocoon is shown next to it. Phalaenoides glycinae Vine Moth facial Photo E Collins Spectacularly hairy face and legs. Photo E Collins Spectacularly hairy face and legs. Processionary Caterpillars Ochrogaster lunifer Photo E Collins Also know as Bag Shelter Moth larvae as they build a shelter to rest in.The hairs are irritants and best not touched. Photo E Collins Also know as Bag Shelter Moth larvae as they build a shelter to rest in.The hairs are irritants and best not touched. Psilogramma casuarinae Privet Hawk Moth larva Photo E Collins Beautifully patterned caterpillar which changes colour as it matures. 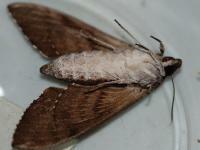 Hawk Moth caterpillars can be recognised by the horn projecting from the rear end. 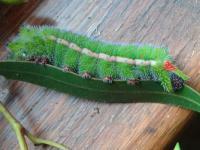 Photo E Collins Beautifully patterned caterpillar which changes colour as it matures. 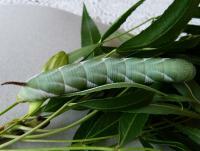 Hawk Moth caterpillars can be recognised by the horn projecting from the rear end. 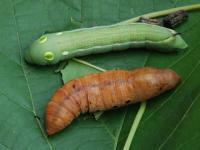 Psilogramma casuarinae Privet Hawk Moth larva Photo E Collins This coulor change took place in 24 hours. Photo E Collins This coulor change took place in 24 hours. Psilogramma casurarinae Photo E Collins Hawk moths emerge at dusk to feed on nectar. Rather than alight they hover to feed. 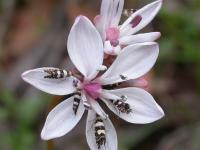 They have a long proboscis which can reach into tubular flowers. Hawk moths are important pollinators. 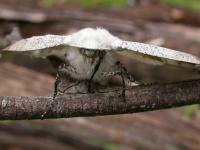 Photo E Collins Hawk moths emerge at dusk to feed on nectar. Rather than alight they hover to feed. They have a long proboscis which can reach into tubular flowers. Hawk moths are important pollinators. 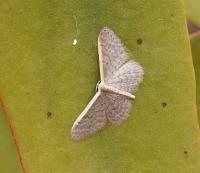 Psilogramma casurarinae Photo E Collins Showing the underwing pattern. 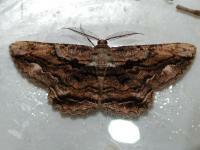 Photo E Collins Showing the underwing pattern. Satin Forester moths Pollanisus. Photo N Blair Beautiful small iridescent moth often found on Golden Everlastings. Captured here mating. 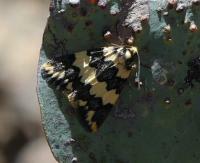 Photo N Blair Beautiful small iridescent moth often found on Golden Everlastings. Captured here mating. Snout Moth Cambridae genus Hednota Photo E Collins This small, beautifully patterned moth lives among grasses and sedges. 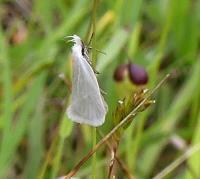 Its larvae feed on grasses and sedges. It is attracted to light. Photo E Collins This small, beautifully patterned moth lives among grasses and sedges. 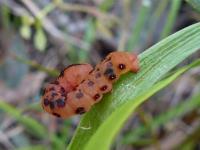 Its larvae feed on grasses and sedges. It is attracted to light. 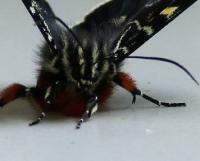 Spilosoma glatignyi Photo N Blair The striking Black and White Tiger Moth bearing the warning colour red signifying " I do not taste nice". The larvae feed on a wide range of herbage. 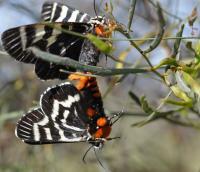 Photo N Blair The striking Black and White Tiger Moth bearing the warning colour red signifying " I do not taste nice". 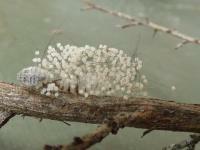 The larvae feed on a wide range of herbage. 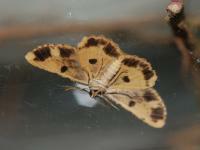 Synemon plana Golden Striated Sun- Moth Photo C Neild-Fest DSE Rare moths. Carboor district. 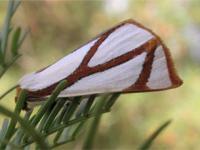 Photo C Neild-Fest DSE Rare moths. Carboor district. 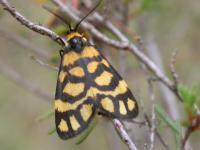 Termessa shepherdi Photo J Heywood Family: Arctiidae, includes Tiger Moths and Footmen. They are weak fliers, brightly coloured and nocturnal in their habits. 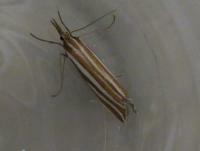 Photo J Heywood Family: Arctiidae, includes Tiger Moths and Footmen. They are weak fliers, brightly coloured and nocturnal in their habits. Thema holoxesta Photo J Heywood October. Not commonly seen. ID from P Marriot. Photo J Heywood October. Not commonly seen. ID from P Marriot. 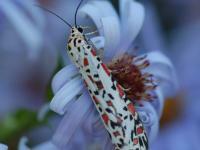 Utetheisa pulchelloides Heliotrope Moth Photo E Collins This day and night flying moth is a pest of Paterson's Curse. Very useful! 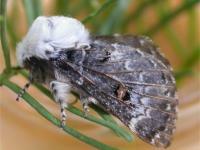 Photo E Collins This day and night flying moth is a pest of Paterson's Curse. Very useful!